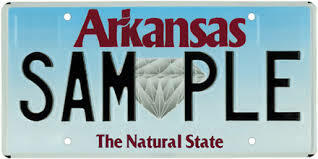 The Arkansas Department of Motor Vehicles issues license plates to vehicle owners in the state of Arkansas. License plates are issued to Motorcycles, All-terrain vehicles, Passenger cars/trucks/ vans and Mobile homes. All vehicles in Arkansas need to have a license plate on the rear. Having a license plate on the rear of the vehicle is mandatory as these plates show the expiration date of the registration. In addition to the standard plates, specialty plates are also offered. However, they are issued only to organizations and for special cases. To begin your Arkansas license plate lookup online use the above form. Regardless of the license plate you want, you must apply for a license plate within a month after purchasing the vehicle. There are three ways of applying for a license plate: in-person, via mail and online. You can use the same three ways to perform Arkansas License Plate Lookup too. In addition to these three ways, you can request for the license plate or vehicle information you need over the phone. The most commonly used ways of accessing Arkansas license plate or vehicle information are using online public databases and making a request to the Arkansas Department of Motor Vehicles. To make a request for the license plate or vehicle information you need over the phone, call: 501-682-4692. Making an online request to the Arkansas Department of Motor Vehicles is rather easy. All you have to do is visit their website and do the needful. Now, the other way of performing Arkansas license plate Lookup is incredibly convenient. Run by private organizations, the online public databases allow you to lookup the license plate or vehicle information you need with a simple click of the mouse. To perform Arkansas license plate Lookup using these online databases, you simply need to sign up with them, pay the required fee, and enter the relevant license plate number or vehicle owner’s name. If you want to perform Arkansas license plate Lookup quickly and conveniently, online public databases are the lookup method you should choose. There you have it: two simple ways of performing Arkansas license plate number lookup. I have not received my tags in the mail yet. They are due this month. I have accessed and paid property taxes and already paid for my tags. I have done everything I am suppose to do; however, have not received them in the mail yet. We can definitely help you with an Arkansas License Plate Lookup however we don’t have any control over registration issues. I would contact the Arkansas Department of Finance and Administration ( Arkansas DFA ). I have included some helpful links below. Please reach out if there are any additional license plate or VIN number questions.